Need a quick DIY gift? Or are you just craving a lovely soak in the tub? Either way this is a great, quick project. I made them as a late Christmas gift for a couple of my co-workers. I originally found the recipe here but modified it to make it a bit simpler. My glass jar collection is multiplying quicker than I can use them so my husband was happy to see me use a couple of them! I used all the baking soda that I had which was almost 3/4 cup. You can use more or less...it doesn't make much difference. I then filled the measuring cup past the 2 cup line with epsom salt. Again, it's not precise. You can use twice as much epsom salt if you prefer or are making a larger batch. Mix in your essential oils. The lavender I used is safe to use on your body and the lemon is from Young Living Essential Oils and it is a food-grade oil, meaning it can even be safely ingested. I wouldn't recommend just getting any oil. Many are designed only for aromatherapy purposes and shouldn't be put on or in your body. Do a little research before buying the cheapest oil on the shelf. I personally stick with Young Living brand most of the time because I trust that brand and have seen great results with them. I used maybe 40 drops of each oil and I added it at intervals. I moved several large spoon fulls into another measuring cup and then dripped the oils, mixed, then added more of the salt/baking soda and repeated the process until the entire thing was thoroughly mixed and smelled heavenly! If you're making the same size that I did, you may not need as many drops. I got a little overexcited because I just love the smell of lemon and lavender together! I decided it needed a little color so it looked the part so I mixed in yellow food coloring in the same way as the oils, at intervals until thoroughly mixed. Yes I know, it looks orange but I swear it came from the yellow food coloring bottle! Mix, mix, mix. And there it is...yellow! I told you so! Gather your jars with their lovely spray painted lids. Most jars have the product label and info on the lid so I spray paint them to make them cute. Now fill 'em up! This recipe filled these two jars almost full. They were salsa jars, maybe half the size of a regular mason jar. Print your labels, cut them to size and adhere them to your jar and you're ready to go! I used hot glue to get them to stick. Lovely little gift in no time! Plus the house smells great! I also want to note that in order to make this a nice hand/body scrub instead is just add in olive oil! Basically two gifts in one! Quite nifty if I say so myself! I think I need to make a batch just for myself! Definitely going to make more of these for family soon too! It's such a nice alternative to those standard bath gift sets that are a dime a dozen at Wal-Mart. What do you think? Wouldn't it be nice to soak in a lemon lavender bath? Mmm...or how about a foot soak? Ahhh...I'm feeling relaxed just thinking about it! 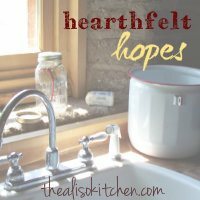 I've linked up to Heartfelt Hopes #4 with The Aliso Kitchen! I usually save them up then take a batch of 10-15 at a time outside on a flattened cardboard box to spray paint all together, makes it a little quicker. It makes them so pretty!